With light colors and a “beach-like” feel, the new website for Dr. David L. Durst offers viewers a beautiful and informative look inside his Huntsville plastic surgery practice. Some of the latest design elements, along with in-depth content and soft color-tones, have been incorporated into this one-of-a-kind website to provide visitors with a comprehensive educational tool as well as a pleasant viewing experience. Dr. Durst’s new site utilizes what’s known as a responsive website design. This makes it possible for the site to be easily viewed and navigated across virtually every major type of digital platform – including desktop computers, laptops, tablets, and smartphones – without sacrificing content or usability just to accommodate a smaller screen. You’ll notice the way the navigation bar drops in at the top of the page when you first open it, as well as the innovative “fly-in” of the flowers as you scroll down. These elements give the site an illusion of movement and vitality without overwhelming the viewer with too much at one time. Of course, substance is just as important as style, and Dr. Durst’s new website gives visitors a thorough look at the many procedures he offers, as well as an overview of his background and philosophy of care. In addition to detailed descriptions of the plastic surgery and non-surgical cosmetic enhancement procedures available at the practice, viewers can find pages devoted to financing and payment options, a video library, a before-and-after photo gallery, and much more. The site has also been optimized for search engines utilizing some of the latest medical SEO techniques, and an updated blog will make it easy to keep adding content and enhancing the site’s online presence. Please take a look at Dr. Durst’s new website at www.drdurst.net. 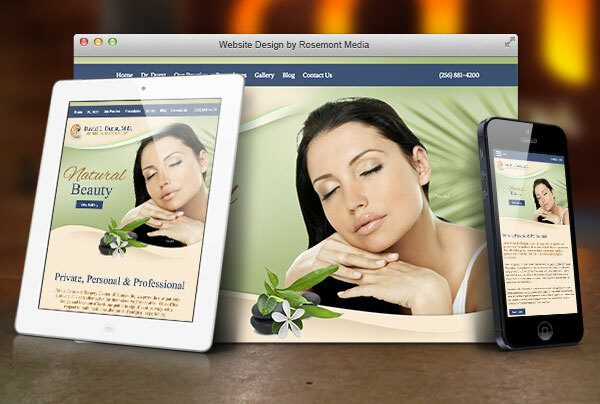 If you would like to learn how the experts at Rosemont Media can create a customized new website for your practice, or upgrade your current site, please contact us today.